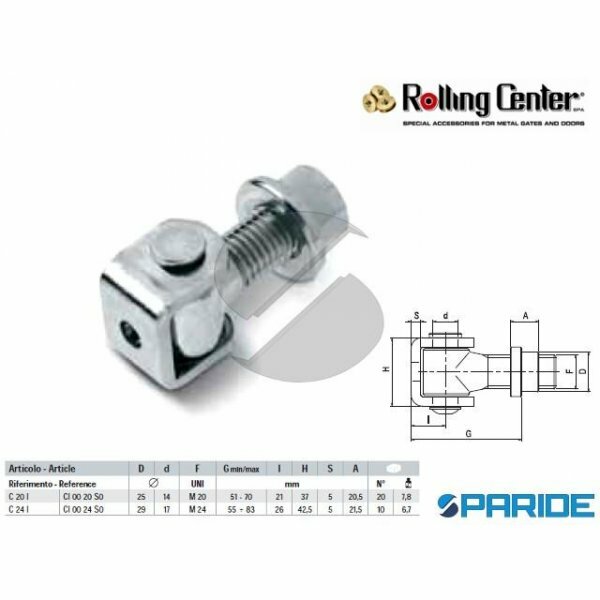 CARDINE A SALDARE C20I INOX ROLLING CENTER. 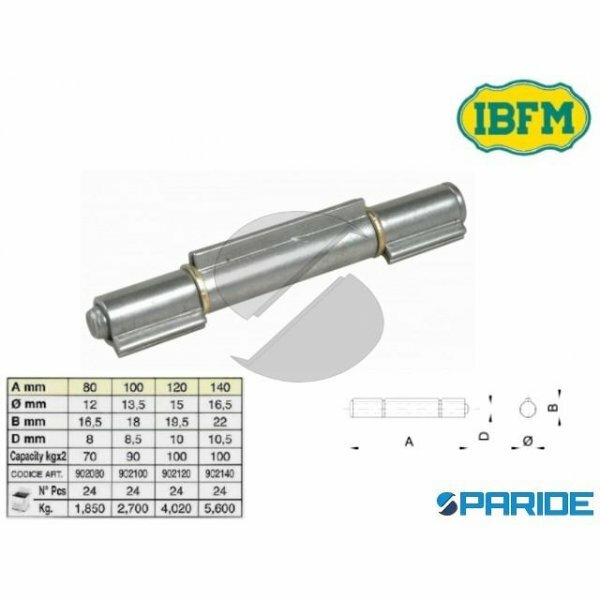 CARDINE A SALDARE ARTICOLO C20I ROLLING CENTER INOX PER CANCELLI IN FERRO, CORSA G DA 51 A 70 MM, ALTEZZA CARDINE 37 MM, DIAMETRO PERNO ..
CERNIERA A SALDARE 10 CM 1222IN10D INOX DESTRA ALDEGHI. CERNIERA A SALDARE, ARTICOLO 1222IN10D ALDEGHI, IN ACCIAIO INOX, PER PORTE E CANCELLI IN FERRO. 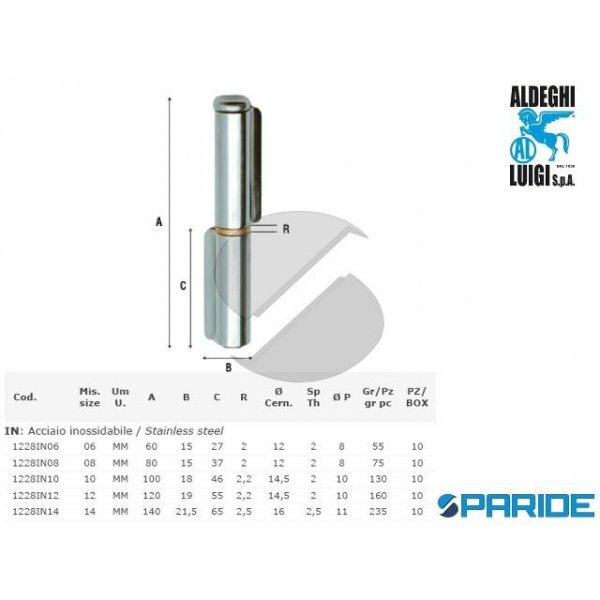 LUNGHEZZA CERNIERA 102 MM, L..
CERNIERA A SALDARE 10 CM 1222IN10S INOX SINISTRA ALDEGHI. CERNIERA A SALDARE, ARTICOLO 1222IN10S ALDEGHI, IN ACCIAIO INOX, PER PORTE E CANCELLI IN FERRO. LUNGHEZZA CERNIERA 102 MM,..
CERNIERA A SALDARE 10 CM 1223IN10 INOX ALDEGHI. CERNIERA A SALDARE, ARTICOLO 1223IN10 ALDEGHI, IN ACCIAIO INOX, PER PORTE E CANCELLI IN FERRO. 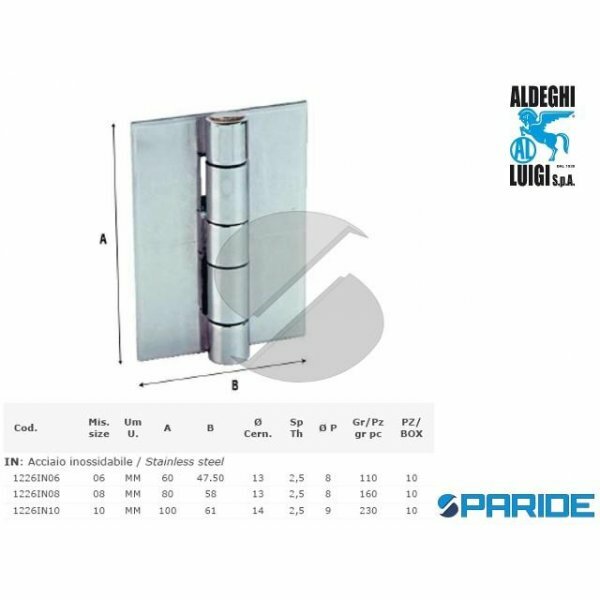 LUNGHEZZA CERNIERA 100 MM, LARGHEZZA ..
CERNIERA A SALDARE 10 CM 1226IN10 INOX ALI PIANE ALDEGHI. CERNIERA A SALDARE, ARTICOLO 1226IN10 ALDEGHI, IN ACCIAIO INOX, CON ALI PIANE, PER PORTE E CANCELLI IN FERRO. LUNGHEZZA 10..
CERNIERA A SALDARE 10 CM 1228IN10 INOX 2 ALI ALDEGHI. CERNIERA A SALDARE, ARTICOLO 1228IN10 ALDEGHI, IN ACCIAIO INOX, CON 2 ALI, PER PORTE E CANCELLI IN FERRO. LUNGHEZZA CERNIERA 1..
CERNIERA A SALDARE 10 CM 1229IN10 INOX 3 ALI ALDEGHI. CERNIERA A SALDARE, ARTICOLO 1229IN10 ALDEGHI, IN ACCIAIO INOX, CON 3 ALI, PER PORTE E CANCELLI IN FERRO. 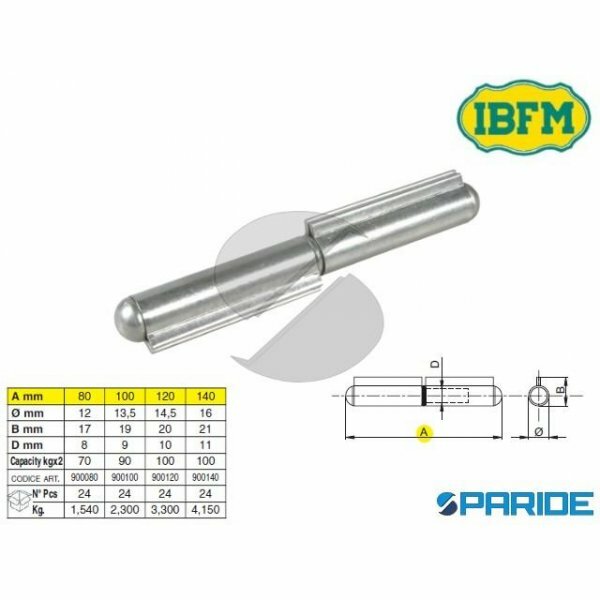 LUNGHEZZA 100 CM, LA..
CERNIERA A SALDARE 100 MM INOX 900 CON PERNO FISSO IBFM. CERNIERA A SALDARE, ARTICOLO 900, IN ACCIAIO INOX, PER PORTE E CANCELLI IN FERRO. 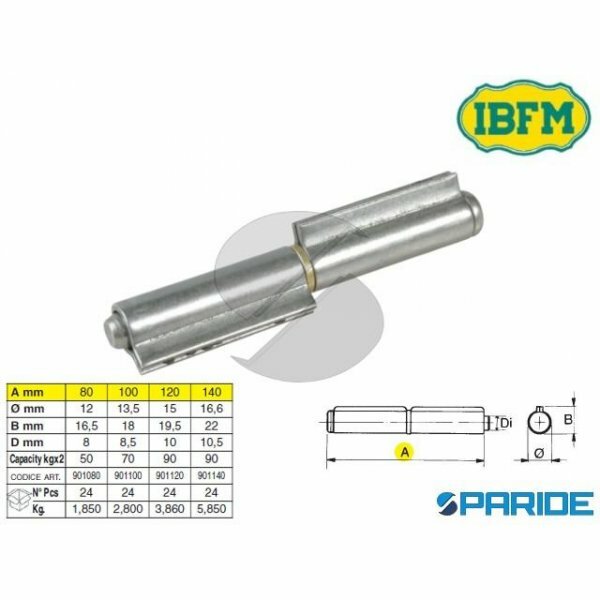 LUNGHEZZA 100 MM, DIAMETRO 13,5 MM, DIAME..
CERNIERA A SALDARE 100 MM INOX 901 CON PERNO FISSO IBFM. CERNIERA A SALDARE, ARTICOLO 901, IN ACCIAIO INOX, PER PORTE E CANCELLI IN FERRO. 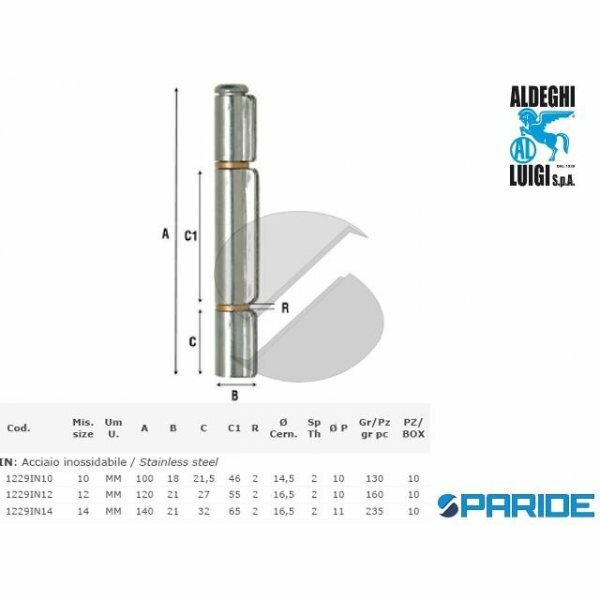 LUNGHEZZA 100 MM, DIAMETRO 13,5 MM, DIAME..
CERNIERA A SALDARE 12 CM 1222IN12S INOX SINISTRA ALDEGHI. CERNIERA A SALDARE, ARTICOLO 1222IN12S ALDEGHI, IN ACCIAIO INOX, PER PORTE E CANCELLI IN FERRO. LUNGHEZZA CERNIERA 122 MM,..
CERNIERA A SALDARE 12 CM 1223IN12 INOX ALDEGHI. CERNIERA A SALDARE, ARTICOLO 1223IN12 ALDEGHI, IN ACCIAIO INOX, PER PORTE E CANCELLI IN FERRO. LUNGHEZZA CERNIERA 120 MM, LARGHEZZA ..
CERNIERA A SALDARE 12 CM 1228IN12 INOX 2 ALI ALDEGHI. CERNIERA A SALDARE, ARTICOLO 1228IN12 ALDEGHI, IN ACCIAIO INOX, PER PORTE E CANCELLI IN FERRO. 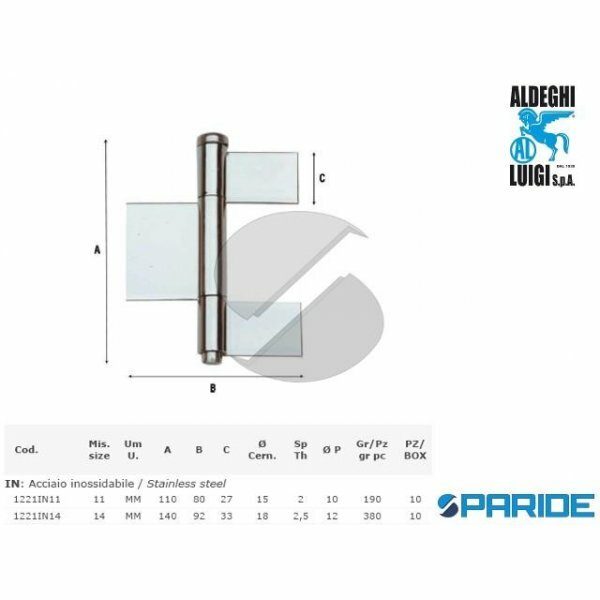 LUNGHEZZA CERNIERA 120 MM, LARG..
CERNIERA A SALDARE 12 CM 1229IN12 INOX 3 ALI ALDEGHI. CERNIERA A SALDARE, ARTICOLO 1229IN12 ALDEGHI, IN ACCIAIO INOX, CON 3 ALI, PER PORTE E CANCELLI IN FERRO. 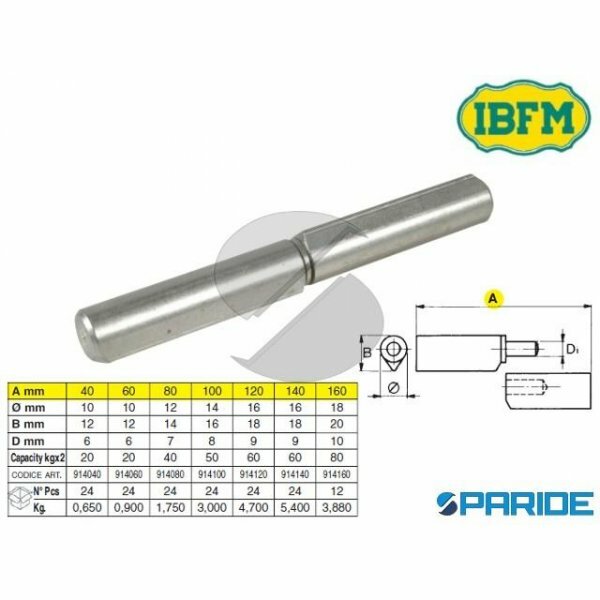 LUNGHEZZA 120 CM, LA..
CERNIERA A SALDARE 120 MM INOX 901 CON PERNO FISSO IBFM. CERNIERA A SALDARE, ARTICOLO 901, IN ACCIAIO INOX, PER PORTE E CANCELLI IN FERRO. LUNGHEZZA 120 MM, DIAMETRO 15 MM, DIAMETR..
CERNIERA A SALDARE 14 CM 1221IN14 INOX CON 3 ALI ALDEGHI. CERNIERA A SALDARE, ARTICOLO 1221IN14 ALDEGHI, IN ACCIAIO INOX, CON 3 ALI, PER SERRAMENTI. LUNGHEZZA 140 MM, LARGHEZZA 92 ..
CERNIERA A SALDARE 14 CM 1223IN14 INOX ALDEGHI. CERNIERA A SALDARE, ARTICOLO 1223IN14 ALDEGHI, IN ACCIAIO INOX, PER PORTE E CANCELLI IN FERRO. LUNGHEZZA CERNIERA 140 MM, LARGHEZZA ..
CERNIERA A SALDARE 14 CM 1228IN14 INOX 2 ALI ALDEGHI. CERNIERA A SALDARE, ARTICOLO 1228IN14 ALDEGHI, IN ACCIAIO INOX, CON 2 ALI, PER PORTE E CANCELLI IN FERRO. LUNGHEZZA CERNIERA 1..
CERNIERA A SALDARE 140 MM INOX 900 CON PERNO FISSO IBFM. CERNIERA A SALDARE, ARTICOLO 900, IN ACCIAIO INOX, PER PORTE E CANCELLI IN FERRO. LUNGHEZZA 140 MM, DIAMETRO 16 MM, DIAMETR..
CERNIERA A SALDARE 140 MM INOX 902 CON 3 ALI E PERNO FISSO IBFM. CERNIERA A SALDARE, ARTICOLO 902, IN ACCIAIO INOX, PER PORTE E CANCELLI IN FERRO. LUNGHEZZA 140 MM, DIAMETRO 16,5 M..
CERNIERA A SALDARE 140 MM INOX 914 CON PERNO FISSO E COSTA IBFM. CERNIERA A SALDARE, ARTICOLO 914, IN ACCIAIO INOX, PER PORTE E CANCELLI IN FERRO. LUNGHEZZA 140 MM, DIAMETRO 16 MM,..
CERNIERA A SALDARE 160 MM INOX 914 CON PERNO FISSO E COSTA IBFM. CERNIERA A SALDARE, ARTICOLO 914, IN ACCIAIO INOX, PER PORTE E CANCELLI IN FERRO. LUNGHEZZA 160 MM, DIAMETRO 18 MM,..
CERNIERA A SALDARE 6 CM 1222IN06D INOX DESTRA ALDEGHI. CERNIERA A SALDARE, ARTICOLO 1222IN06D ALDEGHI, IN ACCIAIO INOX, PER PORTE E CANCELLI IN FERRO. 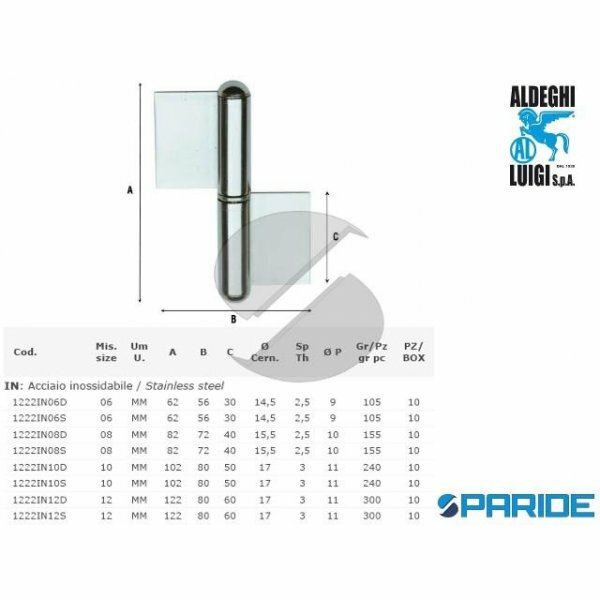 LUNGHEZZA CERNIERA 62 MM, LAR..
CERNIERA A SALDARE 6 CM 1222IN06S INOX SINISTRA ALDEGHI. CERNIERA A SALDARE, ARTICOLO 1222IN06S ALDEGHI, IN ACCIAIO INOX, PER PORTE E CANCELLI IN FERRO. 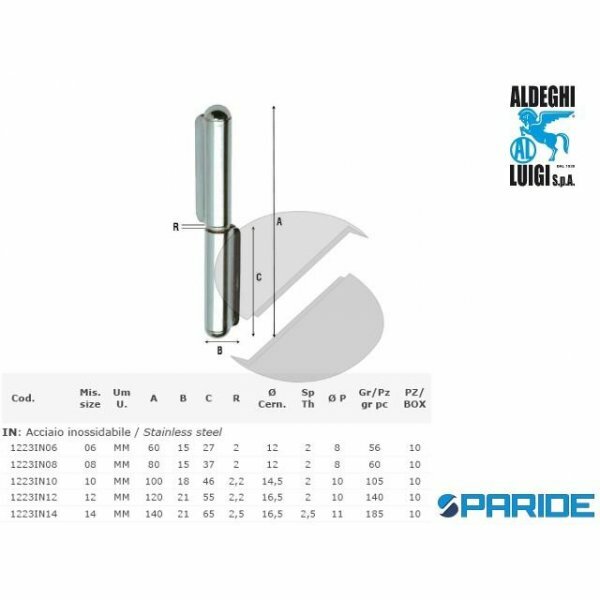 LUNGHEZZA CERNIERA 62 MM, L..
CERNIERA A SALDARE 6 CM 1223IN06 INOX ALDEGHI. CERNIERA A SALDARE, ARTICOLO 1223IN06 ALDEGHI, IN ACCIAIO INOX, PER PORTE E CANCELLI IN FERRO. LUNGHEZZA CERNIERA 60 MM, LARGHEZZA 15..